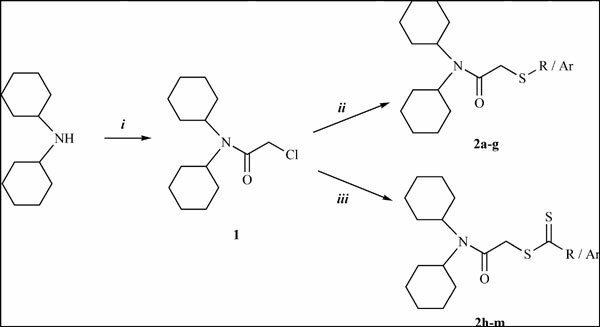 Background: In this study, 2-(substituted-sulfanyl)-N,N-dicyclohexylacetamide derivatives (2a-2g) and 2-(dicyclohexylamino)-2-oxoethyl-1-substituted carbodithioate derivatives (2h-2m) were synthesized and screened for their antimicrobial activity. Methods: Newly synthesized compounds were screened against two gram negative bacteria (S. typhimurium and E.coli), three gram positive bacteria (S. aureus, B. cereus and L. monocytogenes), four Candida species, four Aspergillus spp. and three Penicillium spp. Among them (2a-2m), compounds 2i (2-(dicyclohexylamino)-2-oxoethyl-thiomorpholine-4-carbodithioate) and 2k (2- (dicyclohexylamino)-2-oxoethyl-4-(4-methoxyphenyl)piperazine-1-carbodithioate) were detected to have higher inhibitory effect than other compounds. Results and Conclusion: Minumum inhibitor concentrations (MICs) of the compounds were determined between the range of 97.5-390 µg/mL. Additionally, parameters determined that some physicochemical and toxic properties were predicted using computational methods. Keywords: Dithiocarbamate, lipophilicity, antifungal activity, antibacterial activity, ADME, agents. Keywords:Dithiocarbamate, lipophilicity, antifungal activity, antibacterial activity, ADME, agents. Abstract:Background: In this study, 2-(substituted-sulfanyl)-N,N-dicyclohexylacetamide derivatives (2a-2g) and 2-(dicyclohexylamino)-2-oxoethyl-1-substituted carbodithioate derivatives (2h-2m) were synthesized and screened for their antimicrobial activity.